SP037 - Lowering Springs, Rear, 1.5. BMR Suspension components are proudly hand Made In USA by American workers in our manufacturing facility near Tampa, Florida. We cut, bend, notch, drill, weld, mill, powder coat and package all our high quality performance components from American-made DOM and Chrome-Molly steel. There is nothing like the aggressive look of a car with the right stance! Over time, stock springs sag, get rusty, and simply wear out. BMR Suspension believes the right springs go beyond looksyour GM G-body needs to perform, too! All BMR springs are manufactured from chrome silicon high-tensile spring wire, and are cold wound on a CNC coiling machine. The CNC coiling head can adjust the spring diameter in real time to ensure that every spring is exactly the same. This guarantees that your right spring matches your left spring. Every BMR spring is compressed solid at the factory, not once, but twice. This gives the spring its permanent set, and guarantees no sag. BMR springs are stress-relieved at 750 degrees F, ensuring most stresses induced during the winding process are eliminated. All springs are then shot-peened to eliminate residual surface stresses. Many spring manufacturers skip this step, but BMR insists on this operation as part of our spring manufacturing process. Every spring is computer tested as the last stepevery spring, not just a sample from each batch. Each spring is loaded in the spring tester at the factory, then compressed and the CNC load cell measures the force for a variety of spring lengths. Blending aesthetics and performance, BMR has designed the SP037 for the street performance crowd who want to use their cars in a variety of application. The dual rate springs offer plenty of support, keeping the body flat and level in the corners, while remaining soft enough for a comfortable ride on any road. When performance and looks are a must, rely on BMR Suspension! 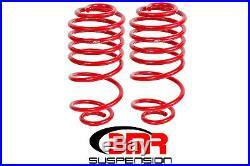 BMR Suspensions SP037 lowering springs are available in red powdercoat for long-lasting good looks. Installation time is about 1 hour. Proudly made in the U. Does not work for Station Wagons. 1978 - 1987 Buick Grand National 1978 - 1987 Buick Regal 1978 - 1987 Chevy Malibu 1978 - 1987 Oldsmobile Cutlass 1978 - 1987 Pontiac Grand Prix Please see the "Compatibility" link at the top of the listing. Proudly Made in USA By American Workers! Please wait until we send you an invoice before you pay! Hen BMR Suspension began back in 1998, it was difficult for performance automotive enthusiasts to find suspension products that had an innovative design and quality construction at an affordable price. BMR turned this market void into a business philosophy, and has been serving our customer's needs ever since. In a manufacturing facility near Tampa, Florida, American workers cut, bend, notch, drill, and mill components from American-made DOM and chrome-moly steel. Then, every product is fixture-welded to maintain consistent quality. Workers bead-blast parts and then powdercoat them using BMR's in-house powdercoating line. Finished parts are then assembled and packaged in the assembly department. By manufacturing every product in house, BMR can control the quality at every stage of the manufacturing process. BMR Suspension products fit and work so well because they are street driven and track tested on BMR project vehicles. Past project cars include a 2005 Mustang drag car, a 2005 Mustang street car, a 2004 GTO, and a 1994 Camaro. BMR's current project vehicles include a 2016 Camaro, three 2015 Mustang GTs, a 2011 Mustang GT, a 2010 Camaro, and a 1969 Camaro. As if that were not enough, BMR also has a 2009 G8 GT, a 2008 Trailblazer SS, a 2003 Mach 1 Mustang, a 2000 Grand Prix GTP, a 1998 Camaro, a 1990 Mustang LX, a 1971 Camaro, a 1970 Chevelle, a 1967 Chevelle, and a 1968 GTO. But it is more than just great vehicles-virtually every BMR employee is a racer or hot rodder, as well. This love of racing is demonstrated everyday in BMR's customer service, design innovation, and manufacturing quality. By continuing to push the envelope in product design innovation and manufacturing technology, you can be sure that BMR Suspension will continue to offer the most innovative, quality-oriented, affordable suspension products available. When performance is a must, rely on BMR Suspension! BMR product applications are warranted to be free from defects in material and workmanship under normal use and service for a period of (2) two years from the date of sale to the original purchaser. BMR product is designed to be used with OEM product and other BMR products. This applies to suspension products from other manufacturers as well as aftermarket exhaust products, aftermarket drivetrain products, and other aftermarket products. The right to make changes in the design or add to or improve on their product without incurring any obligation to install the same on products previously manufactured is expressly reserved. The item "BMR Suspension SP037, Lowering Springs, Rear, 1.5, 1978-1987 G-Body" is in sale since Wednesday, October 24, 2018. This item is in the category "eBay Motors\Parts & Accessories\Car & Truck Parts\Suspension & Steering\Other". The seller is "bmr_suspension_inc" and is located in Seffner, Florida. This item can be shipped worldwide.